The parish is located just outside of downtown Maynard off Rt 27. Take Rt 2W approx. 6 miles to Rt 62. Turn left onto Rt 62W. Follow Rt 62 approx. 5 miles to Rt 27. Turn right onto Rt 27N. Go 0.3 miles on Rt 27, then turn right on Prospect St.
Take Rt 2E 4.5 miles to Rt 27S. Go 3 miles on Rt 27 to Prospect St, turning left on Prospect. Take Rt 117E approx. 7 miles to Rt 62. Turn left onto Rt 62 and follow for 1 mile to Rt 27. Turn left onto Rt 27N, and continue 0.3 miles to Prospect St, turning right onto Prospect. 9:45 AM Hours; 10:00 AM Divine Liturgy. 9:30 AM during the Summer. 9:00 AM Church School (during school year). 6:30 PM Liturgy of the Presanctified Gifts. For a complete list of upcoming services, please visit the parish website. Confessions are heard before or after weekday or Saturday Vespers or by appointment. It all began in Maynard in 1915, at the home of Julian Chutoransky. A small group of Orthodox Christians from Russia, Austria-Hungary and Poland assembled to celebrate the Divine Liturgy together with Fr Jacob Grigorieff, a priest from the Russian Orthodox Church. At many “house-church” gatherings like this, the idea of Holy Annunciation Church took root and grew. In 1916 the dream became a reality with the beautiful church on Prospect St, incorporating the best of rural Russian Church architecture. Today, this church still stands firm—a steadfast witness to the Faith of our Fathers with their hope, determination, and love. In 1970, the Russian Orthodox Church in America received its autocephaly (right to self-government) from the Mother Church in Russia. 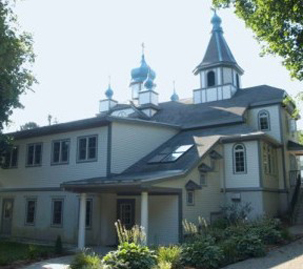 Thus, in accordance with the Canons and ecclesiastical practices of the Orthodox Church around the world, the Russian Orthodox Church in America became the “Orthodox Church in America.” As a member parish of the Orthodox Church in America, Holy Annunciation Church is now dedicated solely to the inhabitants of this continent, with no restrictions to particular ethnic groups or nationalities.